My Ultra Vegas: The Ultra Las Vegas Nightlife Blog: Coming to Vegas? Rent Scooters! Coming to Vegas? Rent Scooters! One of the biggest misconceptions of Las Vegas is that everything on the strip is walking distance..Its Not! The strip is over 4 miles long and can take up to an hour to walk half of it. Factor in the Las Vegas heat and you'll be exhausted by the time you reach your destination. Luckily a mode of transportation once used by only the elderly & handicap is now available to the masses! 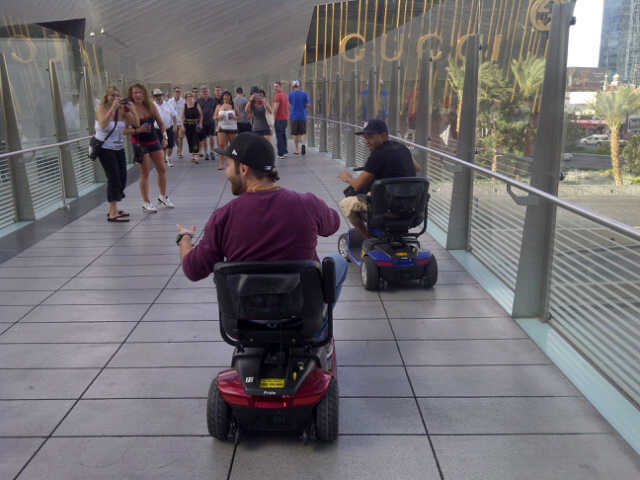 Las Vegas scooter rentals is the Ultra Vegas way to enhance your sin city experience. For as low as $40 you can have your own scooter the entire day & it can be delivered anywhere on the strip. Maximize your vacation and take advantage of Las Vegas Scooters! Hop from hotel to hotel & bar to bar in no time flat! Try it once and you will never want to walk the strip again! Go to www.MyUltraVegas.com and contact us for more info & exclusive discounts on Las Vegas Scooter Rentals! !